Hey, book blogging world! 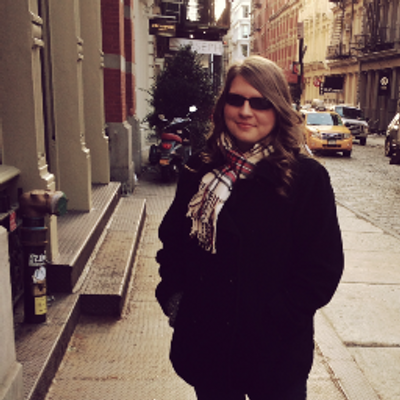 My name is Kendra, and I'm the friendly blogger over at In My Book Nook. I'm so honored to be a part of this event, and so excited to share my opinion on Fallen. For my guest post, I'm going to be focusing on some of the relationships within the story; particularly, the way that Lauren Kate weaved the different characters and emotions together so well. Let's start with the most important, and most controversial relationship: That between Luce, the main female, and her "soul mate", Daniel. We are introduced to Daniel at the beginning of the book, however his connection to Luce is not clear until the end of Fallen. Daniel was mysterious, with an intimidating outer shell for most of the book. I often questioned Luce's attraction to him, while understanding that there was a greater force at play here. I didn't guess the whole story behind their connection, either; which I truly enjoyed. The dark, mysterious, unexplainable connection between Daniel and Luce made their back-story much more convincing, which was impressive. Next up is the relationship between Luce and Cam, who turns out to be the very opposite of Daniel. At first, I fell in love with Cam; he was confident, sweet and appeared to be genuinely interested in Luce with no strings attached. I found myself rooting for him throughout the book. Convincing the reader that Luce was better off with Cam, that Daniel was in fact evil, was a very effective tactic used by Lauren Kate. Because of this, the ending was even more gripping and surprising. In fact, the relationship between Daniel and Cam, which is explained more in Torment, is very perplexing and allows the reader to use their imagination to understand particular parts of the book by asking their own questions. I also loved the relationships between Luce and her friends at Sword and Cross, Arriane and Penn. Each of the two girls had a very distinct character and it was always easy to distinguish between the two. Also, the relationship between Luce and her friends was scarcely over-shadowed by her interest in Daniel or Cam, so I was able to feel Luce's pain when Penn was hurt. However, not all of the relationships within Fallen were positive, as in every book. Lauren Kate did a phenomenal job of keeping me guessing who was good or bad. While I won't give away any more spoilers, I was completely shocked when some of my characters turned out to be horrible and villainous. Overall, Lauren Kate does an incredible job of developing character relationships. The constant conflict and confusion between them was handled skillfully and did not cause me to feel lost of confused within the plot. The writing is also driven and to-the-point, something that is not always found in Young Adult romance. 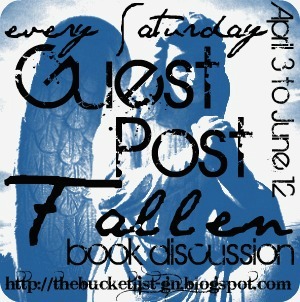 You have just had the lovely time reading Kendra's guest post for my Fallen Book Discussion. Loved her critique on Fallen and some of the characters. You can check her out HERE. Have you written something about Fallen by Lauren Kate? I would love to see it mentioned in the comments! Thank you, Kendra, for joining us today! If anyone else is interested in guest posting something about the Fallen series, please fill out this form HERE. Hope you all have a wonderful weekend! On Monday, I will bringing you my dream cast for the Fallen movie. Grab a copy of Fallen, some snacks, and stay tuned!